The W’s kept on rolling as the Marlins won 3 out of 4 versus the Arizona Diamondbacks ending their 10 game home stand at an impressive 8-2 and despite not winning the series in Chicago, at least we took one. We also can’t forget the awesome no hitter Edinson Volquez threw, which was the 6th no hitter in franchise history. Let’s get to it with the opening game. Jeff Locke made his Marlins debut going toe-to-toe with Zack Greinke. Both our runs came at the bottom of the third with Giancarlo Stanton driving in J.T. Riddle and Dee Gordon on a line drive to right field that was followed by a throwing error from Diamondbacks outfielder Chris Owings. Locke had a strong debut lasting into the 6th inning, as he was pulled with two outs with runners on first and second. Paul Goldschmidt was up to bat. Good ‘ol David Phelps kept up the good work ending the threat. If only that was the last inning. The bullpen couldn’t hold down the Diamondbacks as Kyle Barraclough walked the first two batters he faced in the eighth. He was quickly yanked, but Brad Ziegler gave up the go-ahead single to shortstop Nick Ahmed, scoring two. Both runs were charged to a very frustrated looking Barraclough. I wasn’t surprised the bullpen coughed up the lead. It isn’t the first and won’t be the last, I’ll wager, but my own frustration wouldn’t manifest itself until afterwards. Dee managed to get on base extending his hit streak to 11 and even swiped a bag to help our cause, but Arizona reliever Archie Bradley struck out Stanton and Marcell Ozuna to end the inning, despite walking Christian Yelich in between. Oh, it gets worse. Not only did we fail to get anything going in the ninth, we were also closed out by Fernando Rodney, falling 3-2. Hate is a strong word, but I really dislike that guy. Make no mistake, he was an All-Star before last year’s trade to the team but he was absolute garbage from that point forth. Oh the irony. Our four-game winning streak was snapped. Locke for his part pitched 5 and 2/3rds allowing only 3 hits and a run. After that rather deflating loss, the best case scenario I expected was splitting the series. Little did I know how good the Marlins would rebound. The Marlins continued their ongoing theme of scoring early and often with a pair of first inning homeruns by Christian Yelich and Justin Bour, driving in Stanton and Realmuto respectively. It was only the beginning of a major slugfest as the Diamondbacks belted their own two-run shot with Paul Goldschmidt in the third, and yet another, this time from Chris Iannetta, as part of a 3 run fifth to knot the game up at 5 a piece. Stanton broke the tie shortly thereafter with an opposite field homer off of Patrick Corbin. We never looked back, as the team added an insurance run in the seventh with J.T. Realmuto scoring Stanton on a groundball single. The victory put us back on track, as the offense drew up 7 runs on 11 hits on the night. Just as satisfying, after choking the previous night, the bullpen recovered in a big way going 4 2/3 scoreless innings. Dustin McGowan worked 1 and 2/3rd’s innings, as he entered in the fifth with runners at the corners and 1 out. He struck out Yasmany Tomas and retired Brandon Drury to keep it even at 5. David Phelps served up a clean eighth setting up A.J. Ramos for the save. Jarlin Garcia and Nick Wittgren did their part for a combined inning of work. José Ureña got the no-decision after being roughed up for 5 runs on 9 hits, including two homeruns. Gordon’s hit streak meanwhile came to an end Friday night, as he went 0 for 5, whiffing twice. Also worth mentioning, a rather fishy event took place at the ballpark. During the first inning, J.T. Realmuto hit a foul off of the fish tank behind home plate, shattering part of the glass. The fish tank is embedded into the wall and while the glass is supposed to be shatter proof, the ball definitely left a crack sending some water into the dirt. No worries fans, while the fishies probably experience their own version of Y2K and 2012, their world did not come to an end and they were unharmed. Which leads me to the historic game taking place on Saturday. I discussed it at length previously, but it’s worth recapping, no-hitters don’t come often after all. Edinson Volquez tossed the best gem possible, after starting the game on a collision with Rey Fuentes, at first he struck out 10 while the offense broke through in the fourth and eighth inning to help grab the win. Justin Bour singled on a line drive in the fourth, scoring Stanton. Then, in the eighth, Ozuna hit a liner of his own to drive in Stanton yet again. Bour knocked another hit, this time a two-way of his own scoring Christian Yelich to make it 3-0. Volquez’s 98 pitch performance is the first of the season and the 6th in franchise history. The last was by Henderson Alvarez back in September 2013, done in 99 pitches in case you were wondering. This was only the second in Marlins Park history. Volquez did issue two walks but on both occasions the defense came up big with double plays to preserve the no-no, including a sliding stop by Dee Gordon back in the fourth. And It wasn’t the only impactful thing to happen in the inning; Goldschmidt was called safe at first base after Justin Bour left the bag to catch Riddle’s off-the-mark throw, however, the Marlins challenged and the replay showed Bour successfully tagged Goldschmidt before he made it to first, overturning the call. Thank god for the replay challenges. The game was a great experience and I was truly glad to be there. In the series finale Daniel Descalso ended Arizona’s hitting drought with a double off of Vance Worley. Worley would get himself into trouble repeatedly starting in the second inning with runners on third and second with one out. He gets out of the pickle with a groundout to third and a strikeout of his own. The following inning he gets himself into the exact same jam with runners on second and third and only 1 out, with right fielder Chris Owings at the plate. Luckily, he again gets himself out of the inning with another groundout to Dee Gordon, though with the play at first, a run does score, followed by another K, striking out Chris Iannetta. I thought at this point Worley would finally find his rhythm and get into a groove. I was wrong. AGAIN in the fourth, no outs, with runners at second and third, Déjà vu much? Ahmed walked, Fuentes doubled to set up the mess. With a liner to third, Derek Dietrich grabbed the ball and with a spin threw to first for out number 1 relieving some of the pressure. However, Worley would not escape. Descalso smacked one down the line into right field, tying the game up. He played with fire for too long and finally got burned. Vance ended up getting pulled with two outs in the fourth and a runner at second. He only lasted 3 and 2/3rd’s, giving up 5 runs, 3 walks and collected 5 strikeouts as a consolation. I took great comfort knowing our bullpen was rested and ready to go. Turns out I was mostly right. Meanwhile at the plate, a good opportunity presented itself at the bottom of the second. Tyler Moore was at bat with no outs and runners at the corners (Dietrich on first, Ozuna on third) due to the previous play because Goldschmidt more or less air mailed what would’ve been a routine double play moving Ozuna further. Moore clubbed a three-run shot to take the lead firing up both the team and the crowd. He was 2 for 6 with a homer and 5 RBIs with RISP prior to this at-bat. It was also his first homer of the season. We would get runners at the corners again, it was Giancarlo this time around with two outs. Dee stole second during the at-bat, but Stanton grounded out to shortstop Nick Ahmed, who was playing a bit deep to end the inning. Moving to the bottom of the third, Ozuna stood at second with Yelich at third and Derek Dietrich coming to take his licks. This was another shot to add a couple of runs. Though Dietrich does succeed, scoring Yelich on a sac fly making it 4-2, it was all the Marlins could achieve for the inning. Dustin McGowan came in to replace Worley but Goldschmidt crushed one deep that was nearly ruled a homer, making it 5-4 nonetheless. We eventually got out of the inning but three runs worth of damage was already done. Good thing the offense kept up. For the rest of the game the bullpen does a superb job shutting down the Diamondbacks, as Marlins tied it up at the bottom of the fifth, with another sac fly from Dietrich. Then, A.J. Ellis came through big time in the seventh after an 8 minute, 14 pitch showdown with a hit to center-left field allowing Dietrich to make it home. It’s all we needed. The game was won 6-5 and we took the series. Looking back, man that 4-game sweep would have been sweet. Christian Yelich had a good series going 2 for 4 in the second and third contest, garnering 3 runs and 2 RBIs during the four game set including a dinger on Friday, his seventh. Marcell Ozuna went 2 for 4 thrice in all but the first game of the series, keeping the hot bat going, grabbing himself an RBI, a run and lastly a double in the series finale, his ninth of the season. Justin Bour for his part went 2 for 4 on consecutive days launching number 16 out into the bleachers and accumulating 4 RBIs in the 4-game set. Sadly, the injury bug has bitten Bour sending him to the 10-day disabled list with a left ankle contusion. The injury seems to have been sustained on Saturday when he landed awkwardly on first base. This is a significant hit for us, with homeruns more or less being distributed evenly among our Big 3, we’ve effectively lost a third of our power for the near term. He will be missed even if it’s a short time. The pitching staff had a few star performances of their own, namely Edinson Volquez with his awesome no-hitter as well as Jeff Locke’s debut. Though he didn’t get the win, Locke pitched 5 and 2/3rds locking down 7 strikeouts and only allowing a run on 3 hits. Pretty darn good in my book for someone who hasn’t pitched in a while. David Phelps continues on the right path pitching 3 and a third and earning 4 K’s of his own and we can’t forget A.J. Ramos obtaining two saves and 4 whiffs, two in each appearance. We ended the 10-game home stand on a great note. I felt the fish badly needed the momentum, now that they’re heading out on the road starting with the defending World Series Champions, the Chicago Cubs. The Cubbies were riding their own small winning streak, so it wasn’t too far-fetched to think we could steal 2 out of 3 from them. It is baseball after all. The long ball did us in on Monday, as Dan Straily surrendered two homers in an otherwise very strong outing. The first was right in the opening frame, as third basemen Kris Bryant went yard, bringing in Ben Zobrist to make it a 2-run game. It’s all they would need. Albert Almora laced another in the fourth making it 3-zip. We finally got on the board on a sac fly from Dee in the sixth but our bats were otherwise silenced for much of the game going 0 for 7 with RISP. Chances were few but they were there. Ozuna was stranded twice, the first time was when he was at third base in the second inning and again in the seventh, arguably their best shot to score. But more on that in a second. J.T. Riddle doubled to open the sixth and would later score on a sac fly from Gordon. We looked to be back in business with another double from Stanton, ending Cubs starter Eddie Butler’s night, but our bats couldn’t press the attack, as reliever Mike Montgomery dealt with Yelich, ending our push. The seventh would present our best chance at scoring with Ozuna reaching on a single to lead off. Then we were spared a double play when Cubs shortstop Javier Baez couldn’t get a handle on a sharp grounder. Oh it gets better, Ozuna then advanced to third on a wild throw from Montgomery with only 1 out in the inning. Let’s go fish, right? It all falls apart with Derek Dietrich striking out and Tyler Moore grounding out. Well, can’t win ‘em all they say. It was only our second loss in nine games. Up until this point we were averaging six runs per game in the previous eight. Curiously, if you like our power, check this out: the Cubs have hit 37 homeruns in 24 games Talk about living and dying by the long ball. My hopes of winning the series were dashed as the fish got an absolute 10-2 beat down on Tuesday, though it remained relatively close until the seventh. We drew first blood in the opening inning with Realmuto grounding into a base loaded force-out. Stanton scored and it remained 1-0 up until the fifth when Anthony Rizzo smacked a 3-run dong to take the lead. Rizzo entered the game 10-for-26 against Locke with four homers. Number 5 came after Jon Jay and Kris Bryant walked with two outs. Chicago tacked on one more with a two-way from Jason Heyward. Things were still close, as we entered the seventh inning stretch after Riddle reached on a fielding error from shortstop Addison Russell to make it a two-run game. But lord almighty the floodgates opened with 4 doubles in a 6-run effort totally rocking reliever Brian Ellington, putting the game way out of reach. It’s our third loss in our last 10 with the Cubbies nabbing their fifth victory in a row. Locke was given the L.
The Marlins salvaged the series Wednesday night with solo homers from Realmuto and Ozuna in the fourth and fifth, as the bullpen hung on for the win, snapping the Cubs 5 game winning streak. Revenge is sweet. Riddle also contributed, driving in a pair of runs on a line drive in the fourth inning making it 4-2. Not to mention Dee hit a pretty rare triple. With those legs, the Cubs were lucky it wasn’t an inside the park homerun. Our relief corps flirted with danger all night starting in the sixth when the Cubs had two on with one out, though Brad Ziegler regained the advantage. Phelps surrendered a homer in the seventh and Wittgren too gave up a run before A.J. Ramos filled in for the final four outs to win 6-5. Get outta town boys! Quick! Our road trip continues into Pittsburgh before returning home for a brief two game series. Though this week the Marlins went 4-3, I can’t complain, really due to good performances back home. With that said, given the sub .500 record, the Marlins can ill-afford any big slip before All-Star Break if they wish to still be in the mix by then. Tune in next week, stay frosty. Stat of the Week: 3. The Marlins now have 6 no-hitters in franchise history with catcher and Florida native Charles Johnson being a part of half of them. The UM alum was the catcher for the first in 1996 with Al Leiter, the second with Kevin Brown in 1997 and last but certainly not least, A.J. Burnett in 2001. 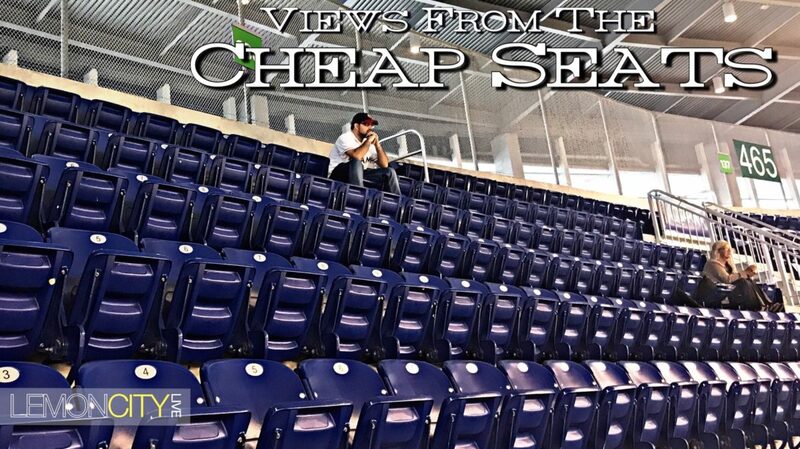 Views from the Cheap Seats is a weekly segment where a Miami raised sports nut recaps, screams and analyses a weeks worth of games giving a toast, or the finger, to his hometown team depending on their performance. A truly hopeful but always realistic fan putting thoughts to pen to paper and always striving to improve. Be bold, be good, be you. The Lemon Drop – PLAY BALL!